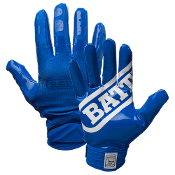 Battle DoubleThreat youth football gloves are made for football players who play hard and keep reaching. That’s why we design them with newly reinforced stitching and wear points. And it’s why we stand by our product with the only 90-Day durability guarantee on the market. Because as football parents ourselves, we get it. Made with PerfectFit breathable material and UltraTack palm that takes you right to the legal stick limit. The proof is in your hands.